Chevrolet has rearranged the pecking order of its Colorado lineup, adding two new trims and shoving the off-road-focused Bison to the head of the table. The Colorado ZR2 Bison will muscle its way into dealer showrooms with a sticker price $48,045 for the gasoline-powered Extended Cab truck, a sum that includes the $995 destination charge. This represents a $5,750 walk from the standard ZR2 in the same bodystyle. Add $1,600 if you want a Crew Cab with four full doors. For customers who either can’t afford or simply don’t want to shell out that much cheddar for a mid-size truck, Chevy is adding two new trim levels to the Colorado lineup for 2019. A Z71 Trail Runner package, shown above in blue, adds the ZR2’s skid plates and rock sliders plus a set of 17-inch Duratrac tires. It also earns the blacked-out CHEVROLET grille first shown on the Bison. 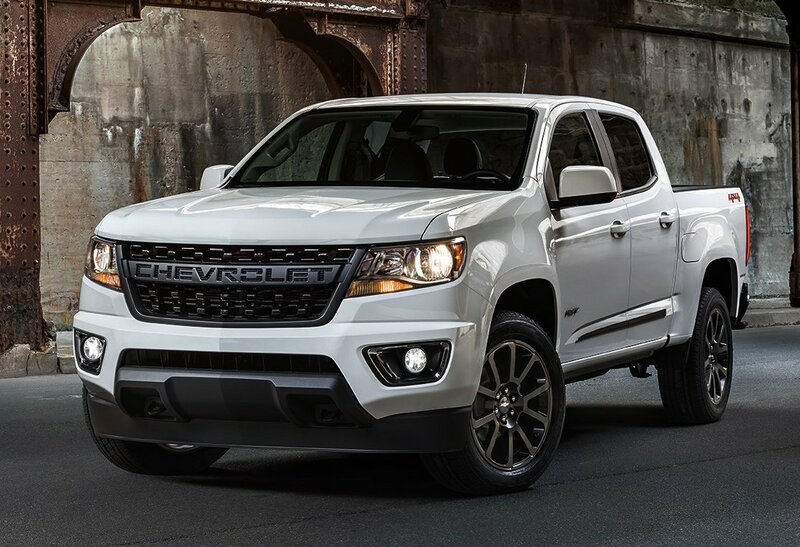 Taking a leaf from the Silverado and Tahoe/Suburban branches of the family tree, the Colorado will also be offered in RST trim, shown here in white. This package will be layered on top of trucks in LT-spec, a mid-grade trim that starts at $32,195. Aimed at pavement-dwelling drivers, the RST adds color-keyed exterior gear and 20-inch wheels. 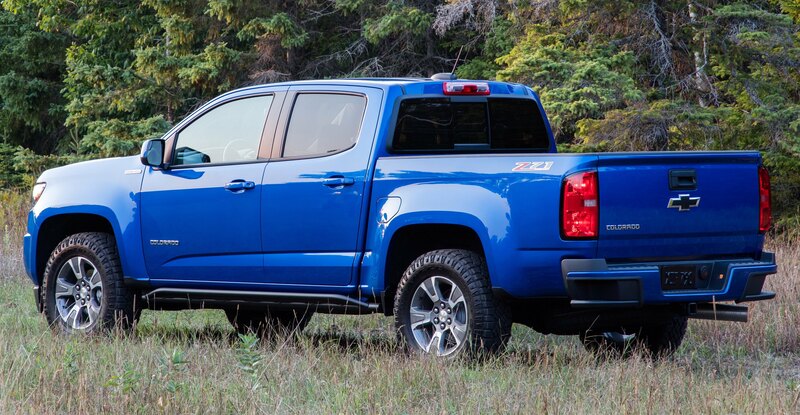 Oh yeah – those who are a fan of the new CHEVROLET billboard (*raises hand*) the company is applying to an increasing number of their pickups will be able to buy it as a separate accessory. This means shoppers willing to part with $395 will be able to append it to the schnoz of even the $21,495 base model 2WD truck which is, don’t forget, still available with a six-speed manual. Chevrolet cranked the Aggro Meter to 11 with the new Colorado ZR2 Bison, an off-road bear built in collaboration with aftermarket house American Expedition Vehicles (AEV). Sitting on 31-inch Goodyear Duratracs, the Bison takes the best parts of the ZR2 pumps them full of ‘roids. Snorkel? Oh yeah. Bash-proof bumpers and skid plates? Check. Optional diesel engine? You got it. 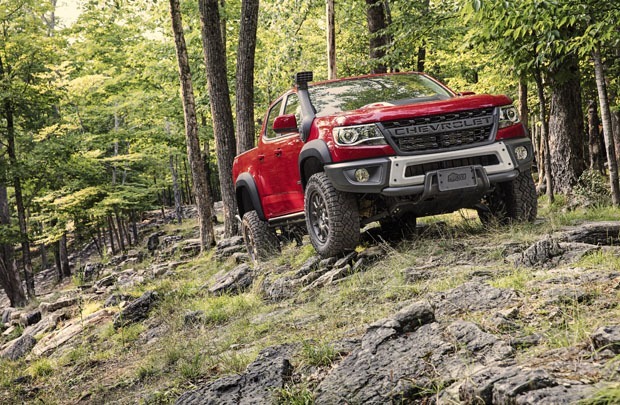 Like the standard ZR2, the Bison sits on a track that is 3.5 inches wider than its mundane brothers and shares the ZR2’s locking electronic diffs, 3.42 rear axle ratio, and two-inch suspension lift. GM’s trick Multimatic DSSV dampers are on board, looking great and providing the ability to jump dunes at speed. Hear that noise, Ford? That’s us thunderously applauding Chevy for making more midsize pickups with factory off-road gear.